Third Psychiatric Clinic, UMHAT "St. Marina", Department of Psychiatry, Medical University of Varna, Bulgaria. Most recommendations for treatment of anxiety in later life are based on evidence, derived from studies of younger populations. An important challenge is the high psychic and physical comorbidity of primary anxiety disorders. The aim of our study was to examine the pharmacological treatment of elderly patients in acute psychiatry setting, presenting with anxiety disorder. All subjects underwent clinical psychiatric examination and evaluation according to ICD-10 and DSM-IV criteria for an anxiety disorder and depression. The patients were examined also for a physical comorbidity. Depressive-anxious or comorbid with depression anxious patients prevailed. Primary solitary anxiety disorders were less seen. High physical comorbidity was registerd. Pharmacologic treatment consisted mostly of benzodiazepines and antidepressants. A considerable number of patients received Quetiapine in their therapeutic plans. Pharmacologic treatment in elderly patients with anxiety disorders should be precisely administered. Standard pharmacotherapy of anxiety disorders for a number of elderly patients needs to be modified. Further research is needed to determine the most appropriate safe and effective treatment model. Key words: anxiety, later life, elderly, therapy. Arnaudova M. Some pharmacologic treatment options in later- life anxiety disorders. J of IMAB. 2013; 19(1):420-422. 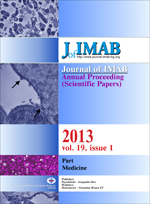 DOI: 10.5272/jimab.2013191.420. 15. Wolitzky-Taylor KB, Castriotta N, Lenze EJ, Stanley MA, Craske MG. Anxiety disorders in older adults: a comprehensive review. Depress Anxiety. 2010 Feb;27(2):190-211. [PubMed] [CrossRef].